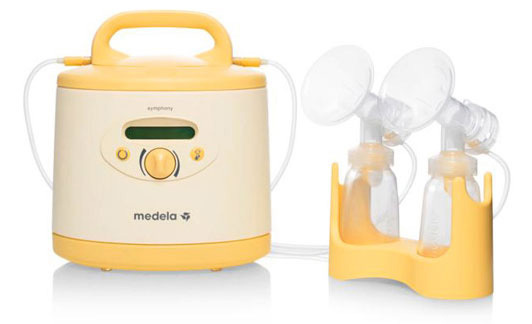 Rent your Symphony PLUS breast pump from Medela UK. Hospital Grade, number 1 choice for hospitals and midwives, as used in 75% of UK maternity hospitals. The Symphony PLUS hospital grade breast pump has been developed specifically to give the necessary support to mothers throughout their lactation journey of preterm and term infants: to initiate, build and maintain an adequate milk supply. Symphony PLUS – designed to mimic the natural sucking pattern of a term born infant. The INITIATE program mimics the irregular and more rapid sucking and pausing pattern of a term born infant during the first few days of lactation. The MAINTAIN program is based on the 2-Phase sucking pattern of a term born infant during established lactation. The unique combination of rapid stimulation and slower expression makes pumping gentle, comfortable and efficient. The Symphony PLUS includes the initiate and maintain pumping program 2 x Pump sets with 24 mm breast shields. The 24 mm breast shield is our standard size which is suitable for the majority of women. Other shield sizes are available to purchase from www.medela.co.uk.